Nintendo must be the world's trickiest undertaking. Or if you're going to be quite honest, the world's dumbest business! While the entire game world companies releasing games for iOS and Android as Nintendo continues to refuse to release their games for these platforms. It's time for Nintendo to realize that the days when you walked around with a game console in your pocket is gone, for looong ago! Although the whole world cries out for Super Mario for mobile devices and refuses Nintendo hopes instead for someone to buy their useless DS consoles. This has been the creators of Lep's World Plus taken advantage of, and therefore created perhaps the most well-made Super Mario clone ever. For real. 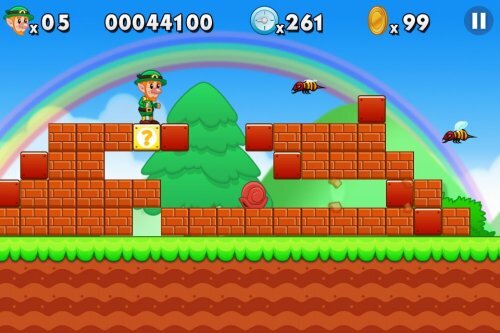 Lep's World Plus is a game that was inspired by the classic game Super Mario World. Just like in Super Mario, you should help the main character Lep to jump and run through the beautiful worlds. If you catch a cloverleaf Lep grows and grows, just like Mario when he gets chaps, a red mushroom. In many of the tracks you can also see the similarities among the enemies from the original. The game feels really well done and it's actually really neat. Although the game is fantastic for a first start, you lose a lot of joy when you discover that joy of playing is found in Super Mario not here. The game looks great, it's not the problem but that's how childishly simple game. Anyone can jump, run and stay away from enemies. If you have been playing Mario since it was small so it feels like this game childishly simple. Almost too easy. It did not take many minutes for me to beta of four courses without any problems. Then I think that the developers behind the game could have chosen different music for each track and not the same sad song the whole game through. But what can you do. A copy is always a copy. Okay, Lep's World Plus is not completely worthless. It is an okay game when you want to kill some time. It is an okay game if you want to dream yourself back to the good old days. What you see is what you get. But expect no Super Mario World, for that you will not get. But since that game right now is in a free version and a premium version, I think you should give it a shot. This is, after all, the closest we will get Super Mario in our phones. Well, if Nintendo does not choose to replace their CEO, but you know both you and I that it will never happen.